Return of the Produce Haul! Nothing but condiments, egg whites, water, 1 yogurt, and some low-sodium V8 in there! Today’s my first day at my exciting new job! I was never a boy scout, but I am prepared. It’s been a while since I’ve worked, and I wanted to set some habits back into place right from the get-go. So I packed a gym bag and woke up early to exercise before work (that’s the plan, at least… I confess that I’m writing this Sunday evening). I also packed a healthy lunch. In fact, I spent hours yesterday prepping food for the work week. And I’m not joking around. I literally spent hours. You must be wearing your lucky pants… because I took pictures! 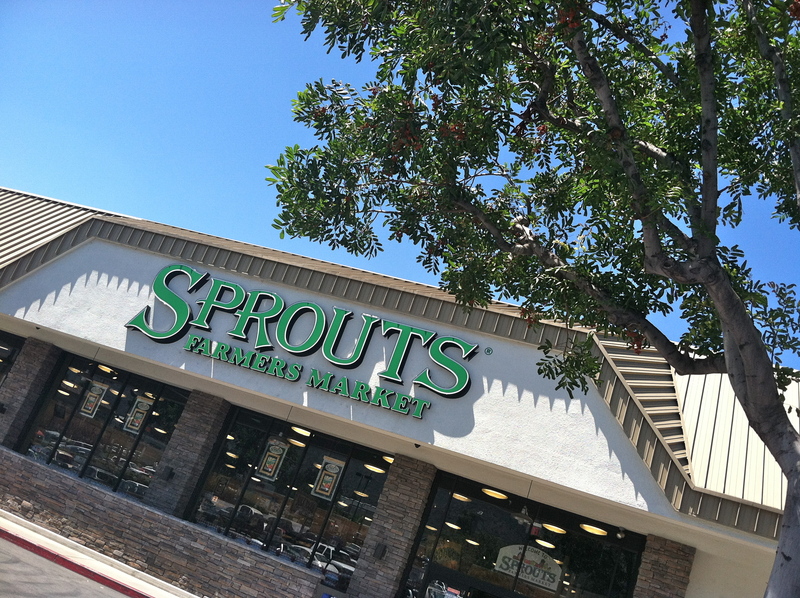 It all started at Sprouts, which is quickly becoming my favorite supermarket, thanks to its prices and its proximity to my gym (two blocks away). My Largest Produce Haul Ever? First, some housekeeping: I did some much-needed page maintenance to Keep It Up, David yesterday, so click through some of the links at the top of the site when you have a chance. The STAIRS! page is gone, since my two stair climb challenges are over, and it’s been replaced with a new Races & Events page that collects info and links relating to all my fitness challenges. I’ve also revamped my motivational speaking page and changed its name from See Me At Whole Foods to the much more direct Motivational Speaking. On top of that, I added my Brooklyn Bridge “Before” and “Current” photos to the Photo Gallery, my two NYC runs to my Running Chart, and the Burj Khalifa to my Skyscraper Collection. Whew! So I’ve been back from New York City for four days now, but you would never know it, since all my blogging has been about my trip. 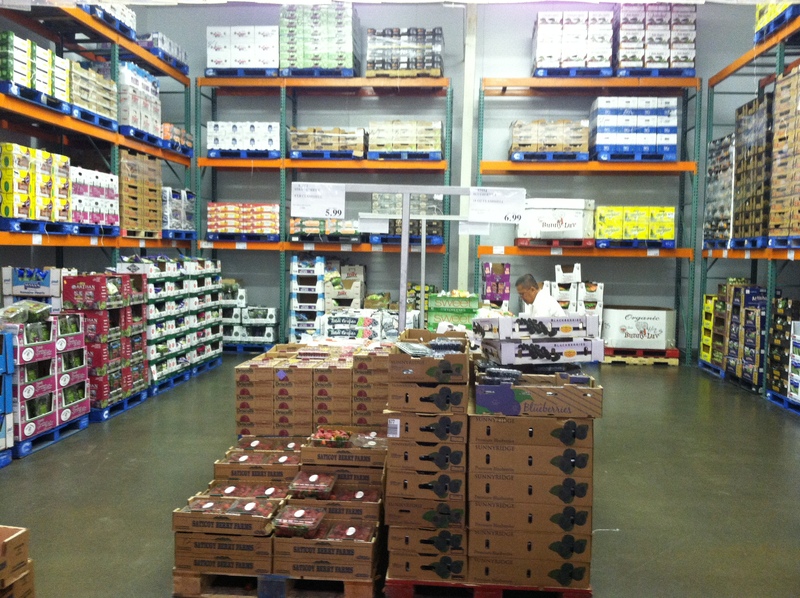 After three New York-centric posts in a row, it’s time to move on… to a post about a gargantuan amount of produce! The title of this post sorta blows any shot I have of building tension, but I’ll try anyway. Guess where I went for the first time the other night? That above sentence needs some clarification. I’ve been in Costco before. 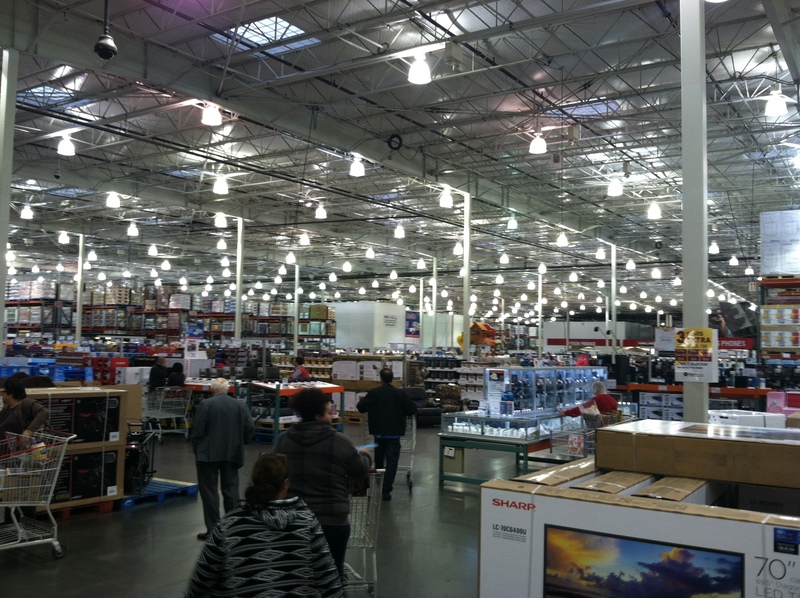 My parents are Costco shoppers, and I’ve gone with my mom to her local Costco in Michigan on numerous occasions. But I’ve never been to Costco on my own, as an adult living in California, to shop for things for my own home. Until the other night. My reasons for not being a Costco shopper are pretty simple: I live alone, and I can rarely justify shopping in bulk. I don’t need 96 rolls of toilet paper, nor do I have the space to store it. 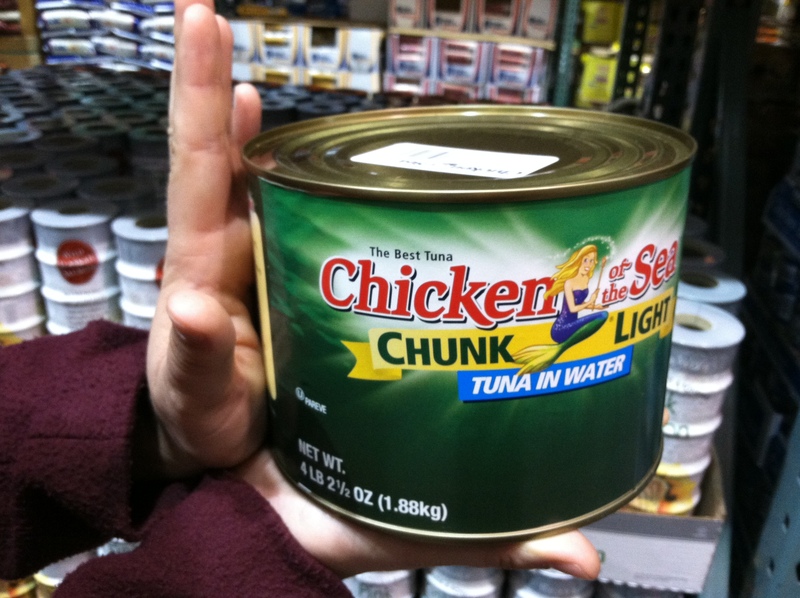 My kitchen is tiny, and while their canned tuna (which I do consume) is very well priced, if I put 18 cans in my cupboard, I’d literally have room for nothing else. I know I could easily become a Costco shopper if I wanted to. I’ve lived, for the past 9 years, within 10 minutes of the Burbank Costco pictured above. And who knows, maybe down the line at some point my life circumstances will change, and a Costco membership will make sense for me. But for right now, I’m happy not having a membership. Plus, I have my friend Tiffany. I learned towards the end of last year that Tiffany (who planned last summer’s awesome kayaking excursion and invited me to my first-ever paintball outing) was an avid Costco shopper, and she invited me along to join her at some point. So the other night we met up, grabbed a cart, and headed inside. Turns out the Burbank Costco is a lot like the one in Michigan I’ve been to: huge. And it was laid out exactly the same, too. I kinda already knew where we were headed, despite having never stepped foot in the store before. I had a shopping list in my head: I wanted to load up my freezer with protein options, and I wanted berries and grapes. I love berries and grapes, but they add up so quickly at the regular grocery store, so I thought Costco might be a nice alternative. I wasn’t afraid of buying these types of fruits in bulk – they freeze nicely, so I can load up a Tupperware if I couldn’t finish them before they went bad. Also on my shopping list: some jewelry, a mattress, 600 pounds of dog food, 15 pounds of mini Snickers bars, a Blu-Ray player, and a tombstone. Kidding. But all available at Costco. I also had a price limit: $100. That figure is what Tiffany owed me for selling her a vacuum a few months ago, so if I stayed under $100 (or as close to $100 as I could get), I wouldn’t have to open my wallet at all, and Tiffany could pick up the entire tab. But I stuck to my list, despite temptations like bathtub-sized amounts of Cheez-Its and 10 pounds of lobster tails for only $171.20. Top row: 1 lb of blackberries ($5), 4 lbs of strawberries ($6). 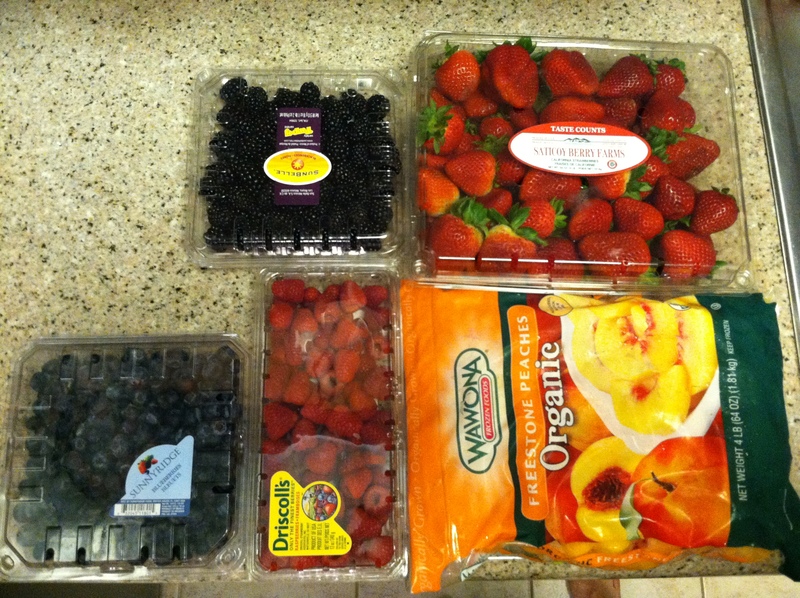 Second row: 1 lb of blueberries ($7), 1 lb of raspberries ($4.50), 4 pounds of frozen peach slices ($7). The grapes weren’t sweet, and they weren’t, per pound, much cheaper than a regular grocery store (which isn’t surprising, as they’re not in season in the US), so I didn’t buy any. That’s why I bought the peaches. I love peaches! And those berry prices are fantastic. Now, for the first time ever in Keep It Up, David history, a PROTEIN HAUL! Top row: 16 Veggie Burgers ($10 – usually this brand is about $5 for 4), 7 zucchini souffles (they may not be high in protein, but I’ve had them before, and enjoy them, and don’t see them that often in regular stores). 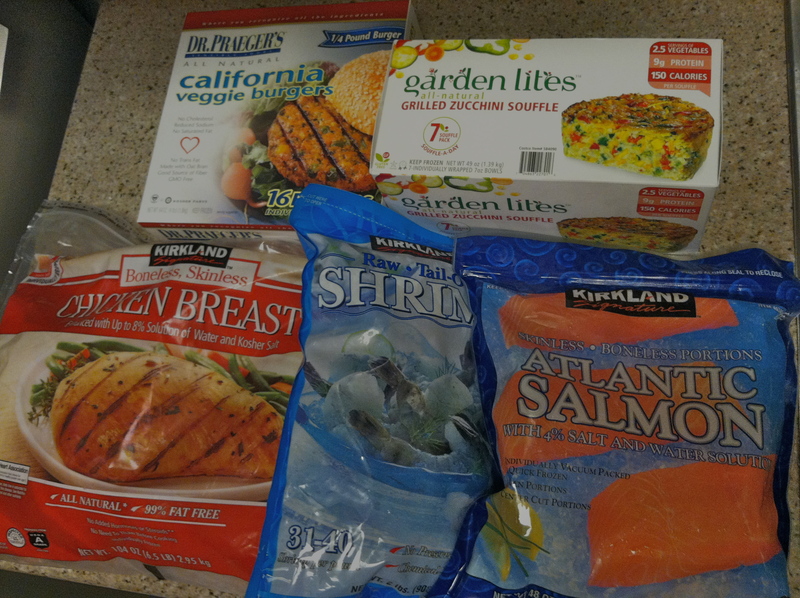 Bottom row: 6.5 lbs of chicken breasts ($17), 2 lbs of shrimp ($13.79), 3 lbs of salmon ($20). The chicken breasts and the salmon fillets are individually wrapped – perfect for a single guy like me. No need to break out your calculators. My grand total was: $103.20 – Almost exactly on target! I’ve never seen my freezer so full before – and I haven’t frozen any of the berries yet! I love having so many healthy options. 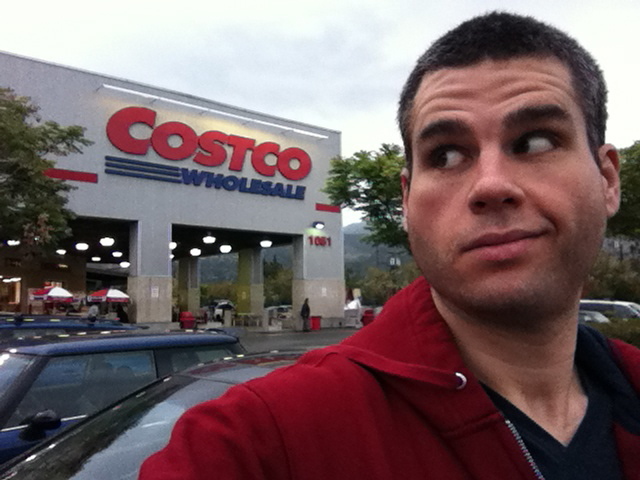 PS: What are your favorite healthy food purchases at Costco? What should I keep an eye out for if I go back with Tiffany? Yesterday was wonderfully productive in a lot of ways. In regards to my health, I checked two big things off my to-do list: 1) a fantastic workout, and 2) a much-needed visit to the supermarket. Which do you wanna hear about first? I hope you said supermarket! 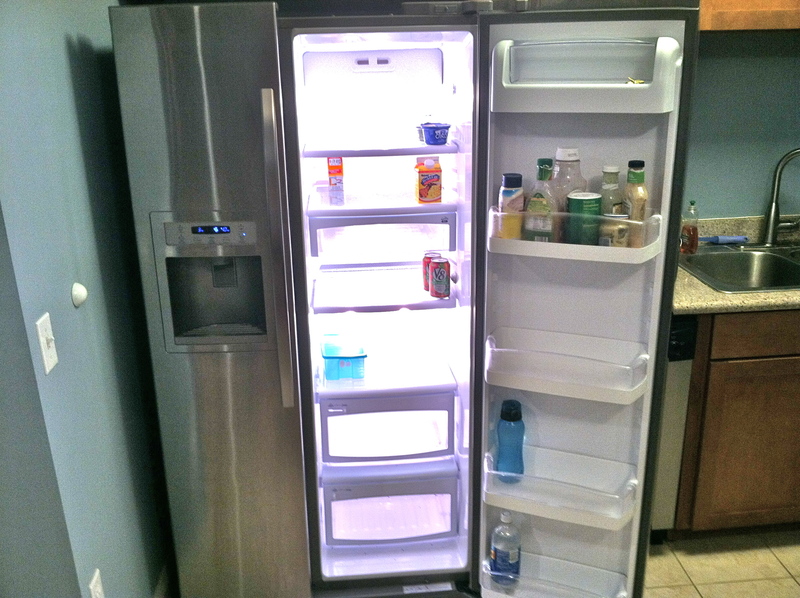 Check out all this produce that’s now in my refrigerator! From left-to-right, top-to-bottom: One head of radicchio, 4 red bartlett pears, strawberries, 1 bag pre-washed and cubed butternut squash, 1 head garlic, 1 pineapple, radishes, mango, 3 red bell peppers, 1 container pre-washed broccoli florets, bananas, escarole, rainier apples, mushrooms, baby carrots, tomatoes, and 2 bags pre-trimmed green beans. I could say that I don’t know what I’ll eat first, but that’d be a lie because all the broccoli is already gone, as is a banana. There were no new-to-me produce items, like sumo tangerines, mini kiwis, or cara cara oranges that caught my eye this time around, but I did find a healthy, pre-made squid salad (!) in the seafood section that I’m excited to try. Something tells me that the idea of squid salad either excites you or grosses you out – there doesn’t seem to be much of a middle ground when it comes to eating squid! I’m firmly on the “yes, please!” side of that fence. Now, my workout! I had a great day at the gym. I started with the StairMaster, for the last time before my big 63-story charity stair climb on Saturday morning. I went for consistency – I set the machine at a good pace that would challenge but not kill me (70 steps per minute) and saw how long I could last. I lasted a pretty long time! All told, I spent 24 minutes on the StairMaster, burning 370 calories and climbing 100 stories – what a nice, round number! Of all the buildings in my Skyscraper Collection, this is the one I’m probably most familiar with. I already mentioned that I’ve been to the observation deck at the top (about 5 or 6 years ago – amazing views! ), and I’ve also admired it from the street more times than I can count, because my brother, sister-in-law, and nephews used to live two blocks away. Quite literally in John Hancock’s shadow. It’s quite an impressive building – as it should be, given that the roof is over 1,100 feet off the ground – but the giant X-braces that criss-cross up the exterior, spanning dozens of floors, really add heft and make the building that much more imposing and dramatic. Jerry Springer owns a condo on the 91st floor, and his neighbor used to be Chris Farley. It was built on land that, prior to the 1870s, was part of Lake Michigan. 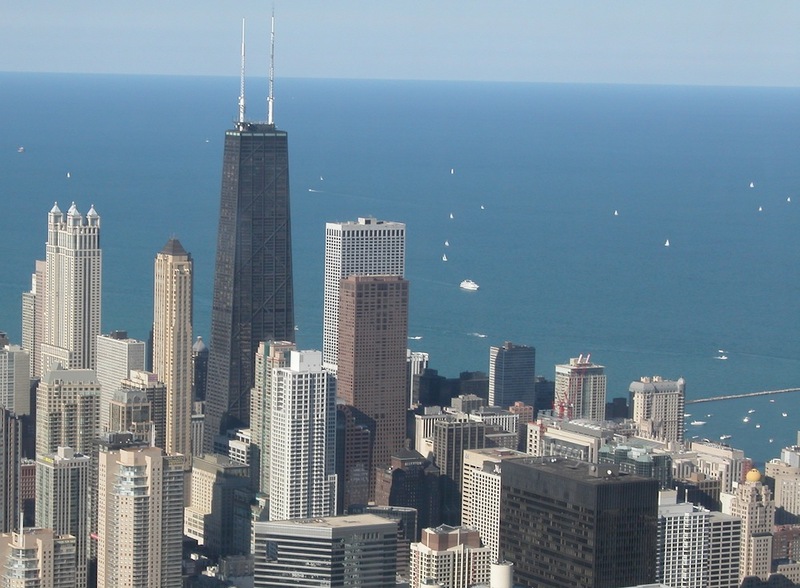 After Chicago’s Great Fire in 1871, cleaning crews and builders began using Lake Michigan as a dump for all the rubble and debris the disaster created, eventually extending the edge of the city hundreds of feet into the lake. John Hancock hosts an annual charity stair climb event, much like the one I’m doing in two days, at the end of every February, called “Hustle Up The Hancock.” This year’s fastest climber, a 24-year-old named Justin Stewart, made it to the top in 9 minutes, 44 seconds. HOLY CRAP, that’s fast! The elevators that take people to the observation deck are the fastest in North America, making the 1,000 foot ascent in 40 seconds. With this final preparatory StairMaster workout under my belt, I feel ready for Saturday’s stair climb up the 63-story Aon Center in downtown Los Angeles. And I won’t be resting before then – I may be done with my prep work on the StairMaster, but doesn’t mean that I’ll be sitting around twiddling my thumbs: I’ll have a full workout today, and a lighter workout on Friday that’s upper-body focused (I don’t want to wake up Saturday morning with sore, heavy legs). I’m ecstatic about the fundraising I’ve done for the event’s organizer, the American Lung Association. 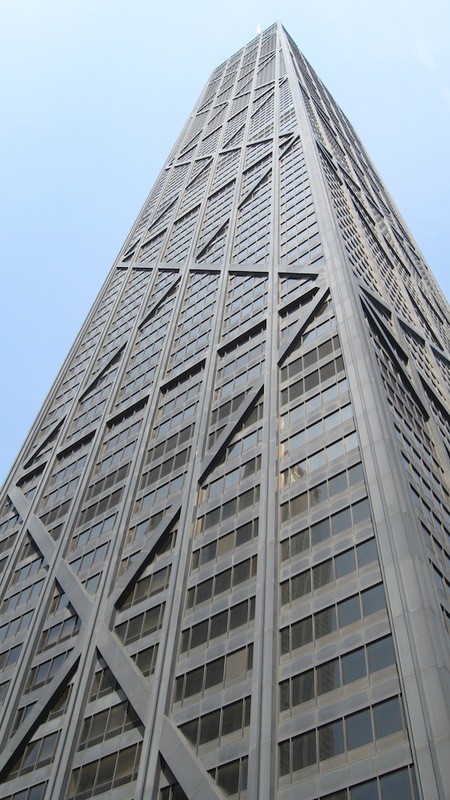 After upping it numerous times based on the incredible response I received, I settled on a final goal of $630 – that’s $10 for every floor in the Aon Center. 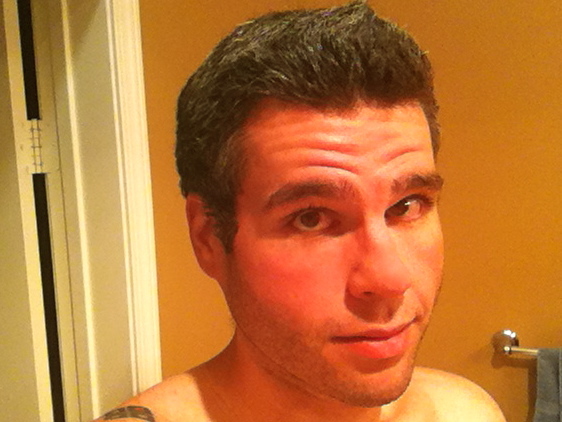 So far, you guys have driven me way past my goal – my current fundraising total is at $697.38. That’s so freakin’ awesome! OH – I NEARLY FORGOT! You guys helped me win a prize! There was a fundraising contest – whoever raised the most money during the week of March 12-16 won a free $100 pair of shoes from a local running store. I heard about the contest but didn’t really do anything above and beyond what I was already doing. But you guys stepped up, and now I’m getting a free pair of shoes! I’ll be sure to share which pair I pick out – and thanks so much! You still have until Saturday to donate – and please don’t let the fact that I’ve already reached my goal deter you! Click here to make a donation on my personal fundraising page. Or, if you’d prefer, I have a second stair climb event coming up in a few weeks, and I’m still a couple hundred dollars shy of that goal (which benefits the awesome Whaley Children’s Center in Flint, Michigan) – Click here and donate to help me reach that goal.